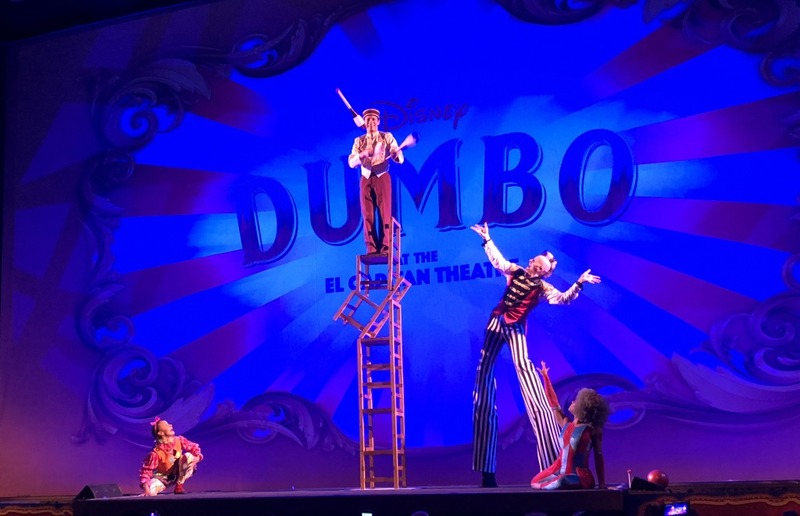 I know this will be hard to believe, but I’ve never seen the original animated Dumbo. It opened way before my time, of course, and there haven’t been many re-releases of it. There was one when I was a little girl, but I think my little mo deemed it too sad for me, not because of the separation from the elephant’s mother but because…I also have giant ears!!! A blurry Karen Salkin (because she’s always in motion!,) with her doppelganger, Dumbo. Photo by Mr. X. And now it’s back as a live-action film, featuring a much-altered story, but still with an ostracized big-eared baby elephant at its core. And the El Capitan in Hollywood is showing it! One of the performers in the lobby. Photo by Karen Salkin, as is the big one at the top of this page. I thank that venue for bringing me wonderful memories by having circus performers greet us in the lobby, and then also do a really fun mini-show for us on the stage before the film. 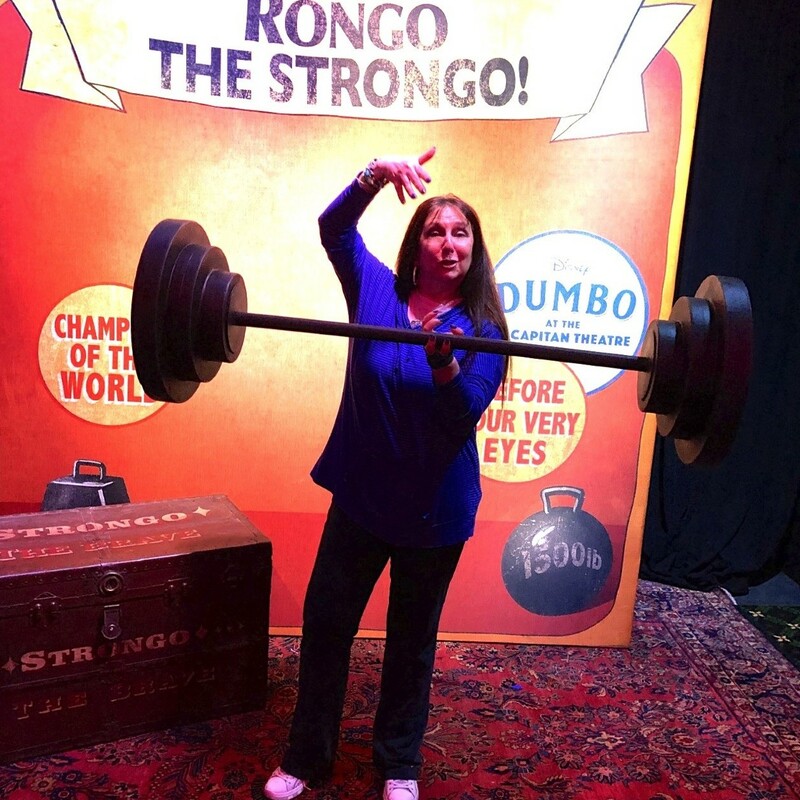 Karen Salkin as Rongo the Strongo! Photo by Mr. X. There are two additional photo ops in the main lobby. 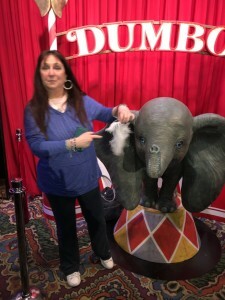 One is with Dumbo himself. 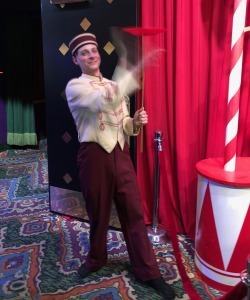 The member of the very helpful staff who takes the pix for you even hands you a feather to pose with, the significance of which eluded me…until I saw the film. (The opportunity is available after the screening, as well, so you may want to take your pictures then, when you know the whole story.) On the other end of the lobby is a giant 3-D floor poster, which is also interesting to pose in front of. The pre-screening show. Photo by Karen Salkin. El Capitan’s stage shows are always entertaining, but this is the best one I’ve ever seen there. First up is their wonderful organist, Rob Richards, whose sparkly red jacket adds a little extra panache to the festivities. He looks like a ringmaster at a Cher concert! 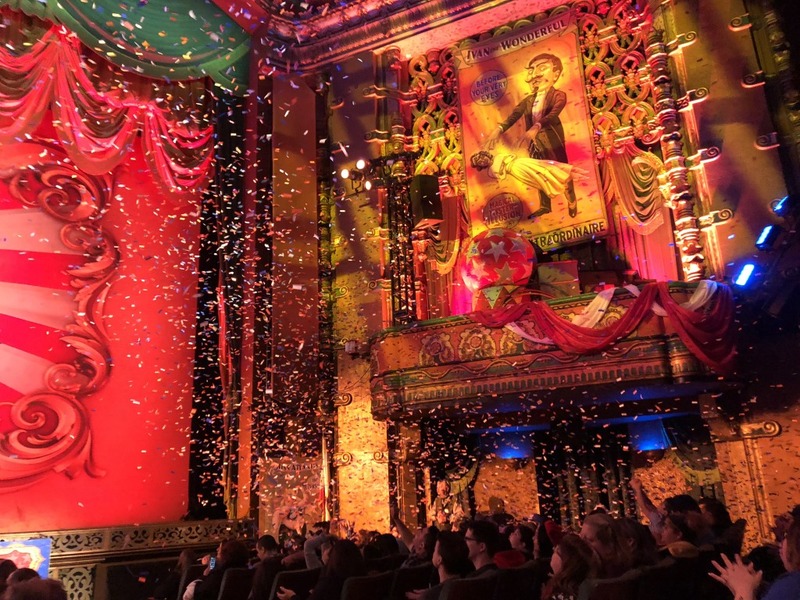 Then comes the aforementioned stage show featuring a quartet of very talented circus performers, which concludes with a colorful confetti cascade. I’m just happy they didn’t call me up to the stage to be the Fat Lady! Don’t forget to look around the entire auditorium because the little balcony boxes are decorated, as well. The El Capitan always has little treats like that for us. 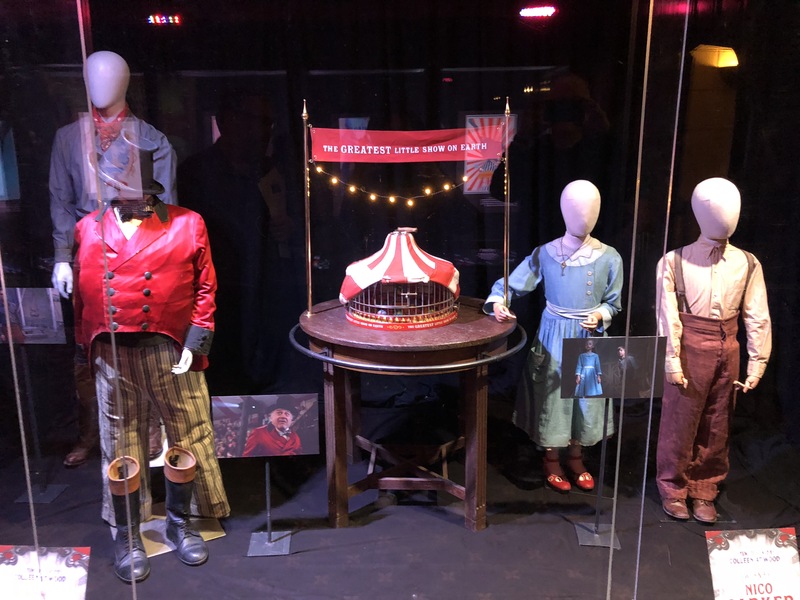 Some of the props and costumes in the display in the lower lobby. Photo by Karen Salkin. 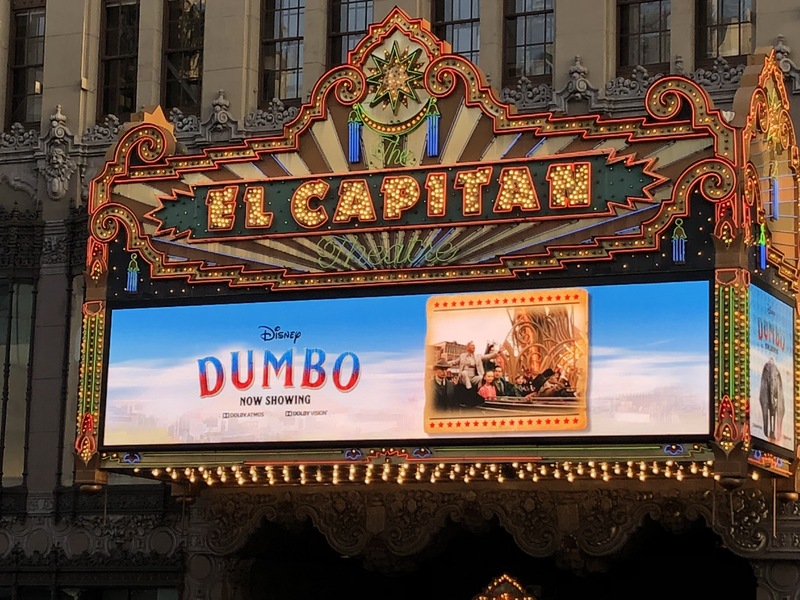 I have to tell you—I have rarely seen such a big and excited audience as the one on the El Capitan’s opening night of Dumbo! A great time was being had by all, children and grown-ups alike. Actually the experiences at that theatre make children of all of us!